The Clan na Gael Players had a humble beginning in 1987. Cardboard sets, lights in cans, folks dragged in from the bar to play a part …! Ahh, but the audience enthusiasm towards this raggle-taggle group – that’s what made Clan na Gael. Performing at the Gaelic American Club and the Fairfield County Irish Festival led to other venues, including Co. Kerry and Co. Clare, Ireland in 2009 and 2016. In 2011 we shared our stage and hosted actors from both counties. Open Auditions, Workshops and our Playwright Contest encourage involvement in our “No Experience Necessary” group. 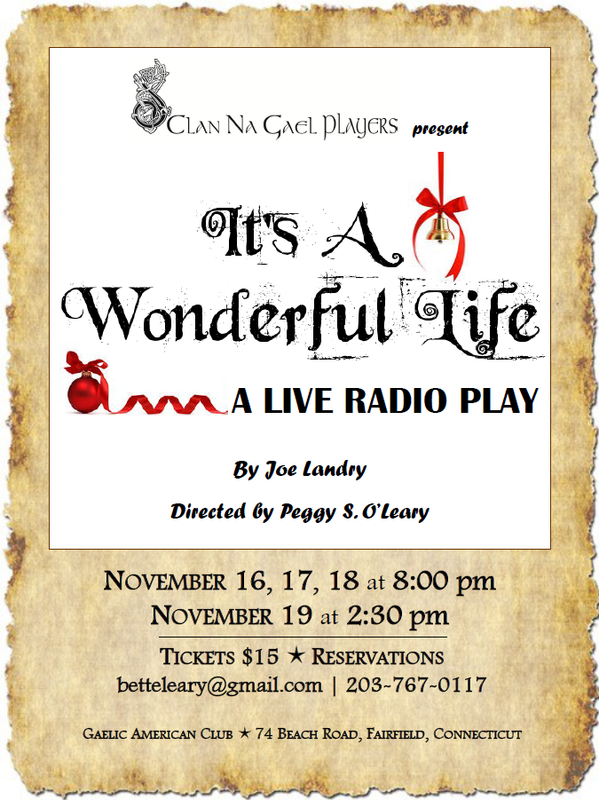 From the pens of well known playwrights, O’Casey, Friel and Keane, have come several Clan na Gael Productions. Proudly, we have worked with playwrights and premiered their plays. Comedy. Drama. Music. Song. Dance. Well known. Unknown. All parts of Clan na Gael. For 30 years we’ve improved our craft both on and behind stage. Hundreds of adults and kids have been a part the fun and excitement of “putting on a show”. Each production brings new actors and production staff. Each performance brings the afterglow of satisfaction that comes from being a part of the Clan na Gael team. We invite you to come play with us. No Experience Necessary. We’re still learning! If you are here for the first time, welcome! We hope to see you again. To all, Thank You for supporting Clan na Gael. We appreciate your patronage. We look forward to continuing our goal of keeping our Irish heritage alive by presenting plays by or about the Irish. You can also find out more about us on facebook.